After reading Measuring Time I knew I wanted to read more of Helon Habila's work. 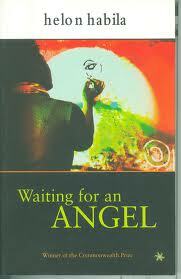 Waiting for an Angel, a collection of interlinked short stories, is Helon Habila's first novel. One of the short stories, Prison Stories, won the 2001 Caine Prize for African Writing, and the novel won the Commonwealth Prize for Best First Novel in 2003. Set in Nigeria during the military's last few years of rule, in the first chapter we meet Lomba, a former journalist and now political prisoner. The book then moves backwards where we meet the people Lomba knew before prison and the life he led. Through these flashbacks we see what these characters lives were like when the military ruled - the hardships they faced, as well as their hopes and dreams. Waiting for an Angel is a powerful book and one I would recommend. I liked this less than Measuring Time. I absolutely loved Measuring Time.